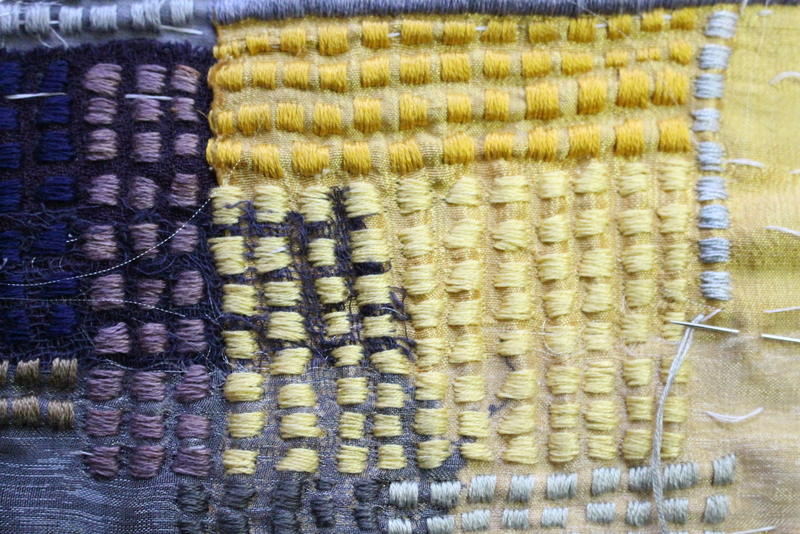 A couple of weeks ago I posted about a layered stitch sample that I’d completed. It was inspired by seeing the Paul Klee exhibition at Tate Modern. I was pleased with the technique and thought I’d take it a bit further into a larger piece and got cracking straight away. I’m nowhere near completing it, but I thought I’d show you progress to date. 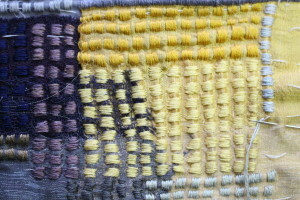 The plan is to have the main area of bright colour placed towards the centre of the sample, with duller greyscale colours on the outside. However, I’ve found previously that these plans can be deceptive; you select a set of rather sombre colours, but then put them together and suddenly by some magical process the finished piece seems a positive riot of colour. The pale green in the foreground looked grey when I selected it, but now it’s definitely green. It seems to me sometimes that the subject of colour is just inexhaustible and that I’ve done no more than nibble at the remotest edges of it. Still, like most things that are worth doing, it’s not likely to be easy. The next photo, below, shows the same work from a different angle. The colour that looked pale green in the first photo now looks much more washed out and grey. You just can’t be sure of anything, but I’d have to say the first photo looks more accurate to me. 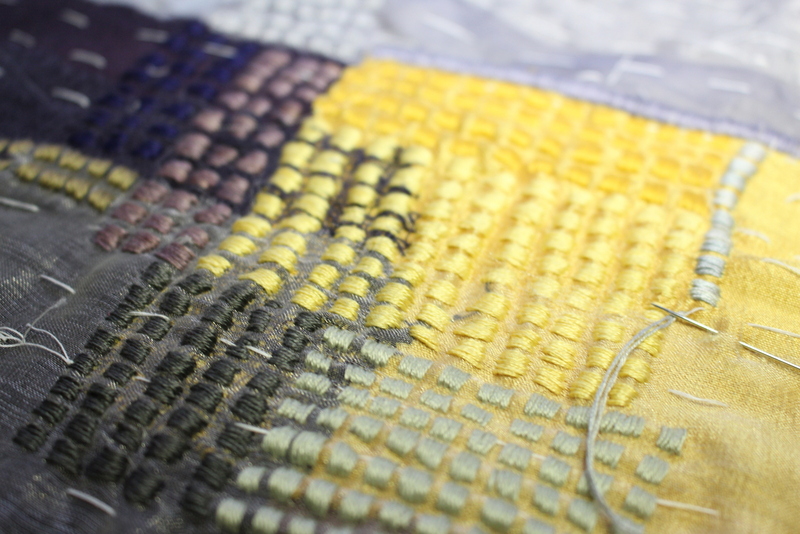 I’ll keep plugging away at this – there are still some quite large areas to stitch, and I’m enjoying the process. It’s taken me a while to come round to Pinterest but now I’m quite the enthusiast. I’ve been impressed by the boards that some talented people have put together, so a few days ago I decided to have a go myself. So far I’ve put together two boards: Yellow Ochre and Chromatic Grey and I’m full of ideas for others. It’s (obviously and duhhh for not spotting it earlier) a very good way of keeping an ordered record of things that you find particularly impressive. And of course, there’s no end to the possible themes and combinations. Working on these boards has been completely absorbing. If you’ve not tried Pinterest, do have a look. How easy is it to get set up on Pinterest? Well, fairly; I’d have to say it’s not completely straightforward. Trying to import a picture for my header was not easy. I made several attempts, checked out the help function and discovered that this is a common problem, so then decided to abandon the attempt for the time being. Next time, I looked,however, there was the picture in the header. It actually worked but looked as though it didn’t. I had a very similar problem with trying to get Pinterest to recognise this website address. Having eventually abandoned the attempt, I then discovered that it had worked after all. 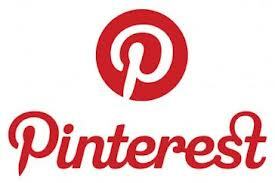 But now that I’m set up finding my way about on Pinterest is easy and intuitive. Wish I done it ages ago. I’ve added a Pinterest icon on my home page (right hand side) so you can click on that any time if you want to see what I’ve been up to.